Specializing in brow design, makeup and eyelash extensions. Our mission is to share our love of beauty with you through exceptional services. The ultimate customized brow shaping experience. Includes consultation, expert advice, quality wax service and a makeup touch-up. Prices vary depending on the experience of the brow guru. A brow wax clean-up for the gentlemen. A quick and easy way to remove those unwanted hairs on the upper lip. Hair will grow back softer and finer. A quick and easy way to remove those unwanted hairs on the chin. A quick and easy way to remove those unwanted hairs on the cheeks. Threading is a method of hair removal that uses a cotton thread to remove one line of hair at a time. It is an alternative to waxing and recommended for anyone with skin sensitivities. A quick and precise way to remove unwanted hairs from the upper lip. A quick and precise way to remove those unwanted hairs from the chin. A quick and precise way to remove those unwanted hairs from the cheeks. Full face threading (does not include brows). A Full Set of man-made silk & nylon synthetic lashes. Synthetic lashes are perfect for anyone who desires a longer lash length. Customized for your face shape and desired look. A Full Set of genuine mink lashes. Ultra fine, natural fibers are a comfortable, luxurious way to add length, volume, and intensity to your eyelashes for a completely natural look. Customized for your face shape and desired look. A Full Set of blended synthetic and genuine mink lashes. Our most popular set for anyone who desires both fullness and length. Customized for your face shape and desired look. Multiple wispy synthetic extensions applied in a "fan" shape. Giving your lashes more density. Soft, fluffy, fullness all with the lightest weight. *If you have delicate natural lashes this is the type for you. Keep your eyelash extensions full and luscious. A Fill is recommended every 2-4 weeks after the initial application. Prices vary with lash artist experience and depend on what type of lashes you choose. Our Lash Lift technique combines a lifting lotion and silicone rods to lift your natural eyelashes, making them look longer and fuller. It is a fantastic alternative to eyelash extensions and there's virtually no aftercare required! Lasts 6-8 weeks. *Not recommended for women who are pregnant or nursing. A gentle, plant based semi-permanent stain that adheres to your natural brow hair. Helps enhance brow color, accentuates shape, and increases the appearance of thickness. Customized to complement your hair and complexion. Fades gradually within 3-5 weeks. Make your eyes pop without makeup! A gentle, plant based semi-permanent stain that adheres to your natural lash hair giving you immediate results. Gentle and safe, no irritation. Fades gradually within 3-5 weeks. Our Lash Lift technique combines a lifting lotion and silicone rods to lift your natural eyelashes, making them look longer and fuller. It is a fantastic alternative to eyelash extensions and there's virtually no aftercare required! Lasts 6-8 weeks. *Lash Lift is not recommended for women who are pregnant or nursing. A customized full face makeup application with a professional makeup artist. Be yourself, look your best. Full face makeup application including airbrush foundation. Airbrush gives flawless coverage, providing skin with a beautifully natural looking result. Perfect for special occasions and photo shoots. Lasts the entire day. A one-on-one appointment with a makeup artist. Bring your own makeup bag, learn tips and tricks to apply to your daily beauty regime. Includes brow fill and eye makeup only. Includes airbrush foundation makeup application only. 1-day wear professional-quality set of dramatic faux eyelashes. Great for parties, special events, photo shoots, or just for fun. Look your best with flawless, photo-ready airbrush makeup that will last the entire day. Bride's receive a complimentary lipstick for touch ups. Trial run, full face makeup application required at least 2 weeks before wedding date to ensure perfection. Flawless, photo-ready airbrush makeup application for all your closeups. Flawless, photo-ready airbrush makeup application for the ladies in your bridal party. Fill out the online bridal form by clicking the button below. Meet Kae, the brains and beauty behind Brow Chic. Kae's focus on brow shaping, lash extensions and makeup have been going strong for the past 13 years. Her sharp eye for down-to-the-last-detail, make her treatments truly unique. She believes beautifully shaped eyebrows are THE way to enhance natural beauty. Esthetician at Brow Chic since 2015. Specializing in Brow Shaping and Eyelash Extensions. Specializing in Brow Shaping, Makeup Services, and Lash Extensions. Master Brow Designer, Advanced Makeup Artist, and Lash Extension Specialist. Specializing in Brow Shaping and Makeup Services. Specializing in Brow Shaping and Lash Lifts. Specializing in Brow Shaping and Makeup. What she loves about her job: "Everyone leaves happier!" What she loves about her job: "Hearing the "WOW" from guests after a brow or lash transformation." What she loves about her job: "Providing support to an amazing team and making sure all of our guests feel like rockstars from the moment they walk in." We now have two locations! Select a location that works best for you. 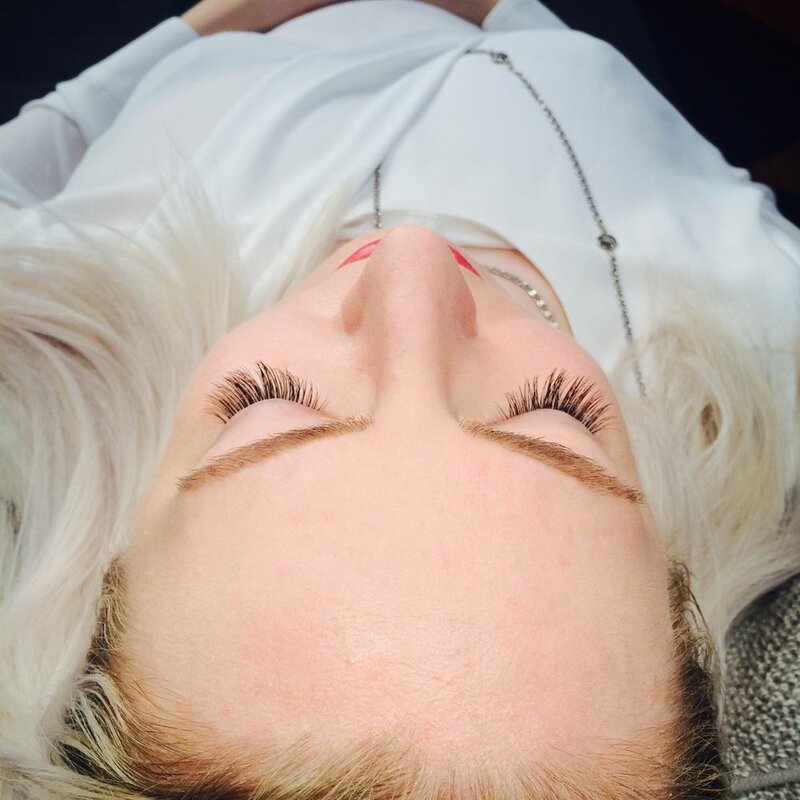 Eyelash extensions are a way to add volume and length to your natural eyelashes. Individual semi-permanent fibers are applied lash to lash across the upper eyelid with a medical grade adhesive. With proper application, lash extensions can look and feel completely natural. Extensions are available in a number of lengths. Your artist will consult with you to understand what shape and style you would like to achieve. DO LASH EXTENSIONS HARM NATURAL LASHES? No. Since we apply the extensions to your natural lashes away from the base, never touching the skin, the growth cycle of the natural lash is not affected. Pulling, picking and touching your lashes is not recommended. HOW MUCH DO Lash Extensions COST? Our prices vary depending on the professional experience of the last artist and also on the variety of lashes you choose. A full set of synthetic lashes start at $180 and prices go up from there. See specific prices under each lash artist's name when you book your appointment online. WHAT CAN i EXPECT AT MY FIRST lash extension APPOINTMENT? A full set appointment is 2 hours. Please arrive a few minutes prior to your start time to fill out paperwork. Your appointment time includes a consultation with your lash artist. You will lay on your back with your eyes closed the entire procedure. We use under-eye gel pads to safely hold down your lower lashes. The process is relaxing and comfortable. Please remove contacts and wear no eye makeup that day. Use an oil free makeup remover if needed. We require a 24-hour notice prior to canceling or changing your appointment. HOW LONG DO Lash Extensions LAST? Eyelash extensions are semi-permanent. They can last for as long as you maintain them. To maintain the look, a lash fill appointment is necessary every 2 to 4 weeks to replace the lashes that have shed or outgrown naturally. WHAT BRAND of Lashes DO WE USE? CAN i STILL WEAR MASCARA with Lash extensions? Yes! Although the extensions give the appearance of wearing mascara, some women choose to wear mascara. We only recommend using The Lashe® Mascara, which has been specially formulated for lash extensions. Other mascaras will cause premature shedding. If you choose to wear mascara, apply sparingly and only on tips; never apply from base to tip. We only recommend using The Lashe® Cleanser, which was also specially formulated not to affect the bond of the adhesive. HOW DO i Care For Lash Extensions ? We recommend that you wait 24 to 48 hours before getting your lashes wet, visit the spa, tan, or spray tan to allow adequate adhesive bonding. For longer lasting lashes, limit the use of running water directly on your lashes. Avoid touching your lashes. Do not perm, curl or pull on your lashes, ever. Only use an oil-free makeup remover to clean and remove eye makeup. If I have lashes on from another place, can I get a Fill from Brow Chic? Yes! But, depending on the condition of your natural lashes and the quality of work from the "other" place, we may have to remove lashes before adding new lashes.